Did Henry VIII outlaw Catholicism just to get a quickie divorce? Did Luther really nail his 95 Theses to a church door? Was the Pope really Catholic? Can you actually exist on a Diet of worms? 500 years ago, Martin Luther nailed his ideas to a church door – and the Reformation began. Or maybe it wasn’t quite as simple as that. Historians tell us that the Protestant Reformation laid the foundations for the Industrial Revolution, religious freedom, and all sorts of other Good Things. But what actually happened? 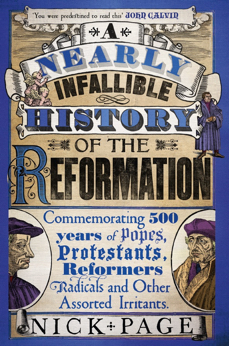 Nick Page explores this key period in European (and world) history in order and uncovers everything you need to know about the Reformation – with a fair few bits you didn’t need to know thrown in for good measure. Along the way we meet the heroes and the villains, the saints and the sinners, the winners and the Luthers, the bad Popes and the even worse Popes, the good, the bad and the Zwingli. Unlicensed historian Nick Page combines in-depth research, historical analysis and cutting-edge guesswork to scintillating effect in this fast-moving examination and laugh-out-loud romp through of the weird and wonderful whirlwind that was church life in late medieval Europe. * Actual percentage not guaranteed.